WEBSTER, Daniel (1782-1852) was an American politician who represented New Hampshire (1813–1817) and Massachusetts (1823–1827) in the United States House of Representatives; served as a Senator from Massachusetts (1827–1841, 1845–1850); and was the United States Secretary of State under Presidents William Henry Harrison (1841), John Tyler (1841–1843), and Millard Fillmore (1850–1852). He and James G. Blaine are the only people to serve as Secretary of State under three presidents. Webster also sought the Whig Party nomination for President in 1836, 1840, and 1852. 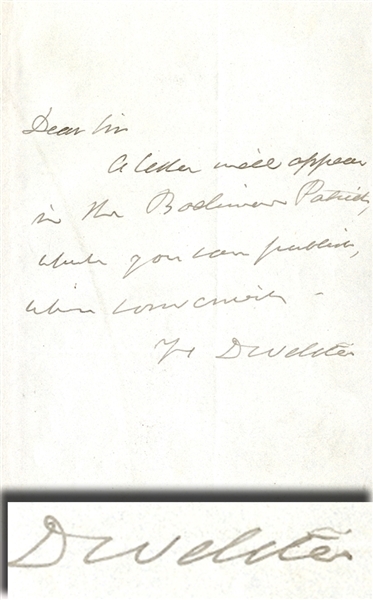 Autograph Letter Signed “D.Webster” 1pp. octavo, nd., pertaining to a letter in a Boston publication. Very good condition.